Architecture, technology, and a family atmosphere are just some of the reasons why so many people love to live and work in Pasadena. Arctic Glacier has been delivering high quality products, such as bagged ice, crushed ice, classic square cube ice and dry ice to businesses and residents in Pasadena for decades, and we are looking forward to many more years of dedicated service. Arctic Glacier understands what it takes to make high quality ice products. It takes the very best in natural water that is put through many purification cycles, which far exceed national standards, resulting in pristine ice. The freezing and preparation processes have to be exact, and the shipping method has to keep the ice fresh all the way up to the customer’s door. That is how we deliver, and that is why our ice is the highest quality in the area. We understand what it means to have the very best ice preserving your food or keeping a vital organ fresh during delivery, and that is why we work so hard to make our ice the very best. 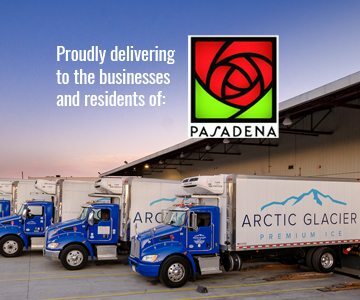 We want to make sure that every Pasadena delivery we make is going to supply our clients with the ice that makes a difference. We know ice because we have spent years perfecting our methods. Our crushed, cubed, and standard ice can be customized to fit your needs, and it is always delivered on time by caring professionals in clean vehicles. Your business requirements are our guidelines. When your Pasadena business relies on Arctic Glacier for its ice, we make sure that we exceed your expectations. We load our delivery trucks quickly to prevent any loss of ice from our facility to your business. Our refrigeration trucks are all set to the perfect temperature to preserve your ice. Our experts are ready to help you calculate your regular ice needs and then develop a delivery schedule that will make sure that you always have the ice you need on hand. If you find yourself in an emergency situation, all you need to do is contact Arctic Glacier and we will be at your door as fast as we can. A successful event is one where every detail is attended to with meticulous detail. When you are planning an event, you can let us take care of your ice needs while you focus on the rest of your event. Our experts will let you know how much of each type of ice you will need, and then we will create a delivery schedule that will let your Pasadena event go off without a problem. The people of Pasadena expect the very best service, and that is what Arctic Glacier delivers every time. From our comprehensive ice making method to our perfectly controlled delivery trucks, we cover every detail to make sure that you get the ice you need to keep your business running.